TATA DOCOMO, the GSM brand of Tata Teleservices Limited, today announced the launch of two unlimited GPRS packages for its prepaid subscribers tagged as Rs 15 GPRS pack and Rs 95 GPRS pack. Rs 15 GPRS pack comes with 3 days validity offering unlimited GPRS access, whereas Rs 95 GPRS pack is valid for 30days and can also be used on PC and laptop. 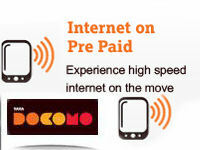 On both the packs one would be charged 10paisa for 10KB while on roaming. Activating Unlimited GPRS pack All you have to do is visit the nearest retailer and recharge your account with Rs 15 or Rs 95. Once done, you need to SMS INTERNET to 52270 to retrieve the GPRS settings, save the same as the ‘default’ settings and start surfing. For manual configuration of GPRS settings more on that click here. try to use idman. this will definately increase your download speed. trust me.